논산 쌍계사 소조석가여래삼불좌상은 조선후기 17세기 초에 활약했던 조각승 元悟비구가 만력 33년(1605)에 수조각승을 맡아 信玄, 淸虛, 神釰, 希春이라는 네 명의 보조조각승과 함께 제작한 상이다. 당시는 임진왜란 중에 피해가 컸던 여러 사찰들의 중창이 곳곳에서 일어나던 시기였으므로 이 때 쌍계사도 2층의 불전을 세우고 그 안에 석가, 아미타, 약사로 구성된 삼불상을 봉안했던 듯하다. 삼불상의 어깨가 넓고 허리가 긴 장대한 체구는 고려후기에서 조선전기로 이어진 불교조각의 전통을 잇고 있으며, 살이 많은 풍만한 얼굴과 부푼 눈두덩, 오뚝한 콧날, 넓은 인중, 입 꼬리가 살짝 올라간 미소 띤 자비로운 표정은 위봉사 북암 보살입상(현재 익산 관음사와 혜봉원에 각각 1구씩 봉안)의 사실적인 얼굴과 거의 흡사하여 원오의 독특한 작풍을 드러낸다. 논산 쌍계사 소조석가여래삼불좌상은 1605년이라는 제작시기가 분명하고 조각승 원오의 대작으로서 조형적으로 우수하다. 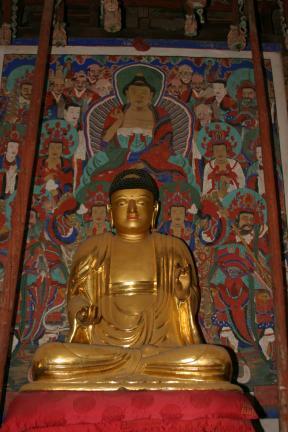 The Clay Seated Sakyamuni Buddha Triad of Ssanggyesa Temple in Nonsan was made in 1605 by a group of five monk-sculptors led by Wono (the other four being Sinhyeon, Cheongheo, Sinil and Huichun), who was active during the early seventeenth century. 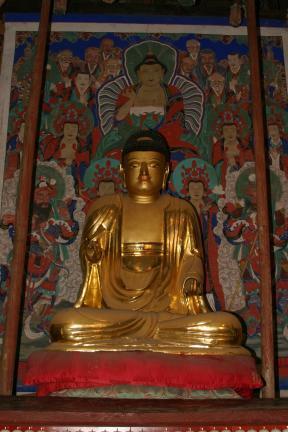 The triad, consisting of Shakyamuni, Amitabha and Bhaisajyaguru, enshrined in the double-story building is one of the Buddhist statues built after the Japanese Invasion of Korea in 1592, which resulted in a seven-year war that devastated Korea. 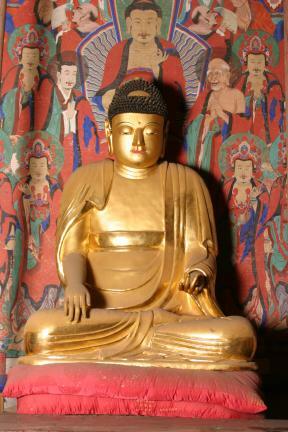 The stately appearance, broad shoulders and long waist of each of the three statues reveal that they were influenced by the sculptural achievements of the late Goryeo to early Joseon period.